James Hird is a legend of Australian football. He won countless matches of his own boot and was one of the most clutch players the league has seen. Hird was a long standing captain of the Essendon Football Club and despite many injuries was able to play over 250 games. Highly versatile, he could play almost anywhere on the ground, coach Kevin Sheedy would often use him to silence an opposition player who was having too much to say in the outcome of a match. Hird would play in 1993 and 2000 premierships, win four club best and fairest awards, five All-Australian selections and the 1996 Brownlow Medal. In addition to his Norm Smith medal for best individual performance in the 2000 grand final, he starred on Anzac day clashes against Collingwood, winning the Anzac Medal three times. Hird was also named in the Essendon Team of the Century and was inducted into the Australian Football Hall of Fame. 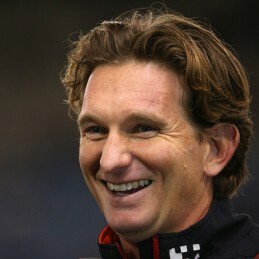 Following his retirement Hird would balance business interests with a career in the media but later returned to coach Essendon in 2010, taking the club to finals in 2011. A highly sought after speaker and master of ceremonies, Hird is an entertaining and eloquent speaker who draws on his experiences of leadership, determination and success.